He may be one of our Founding Fathers, yet one of the most enduring images of Ben Franklin is his electrical escapade with a kite in a thunderstorm. You too can go fly a kite with this clever tea mug from the Unemployed Philosophers Guild, decorated with the popular Currier & Ives print of Ben and his son playing with "electric fire." Their kite string stretches up to a small notch in the rim, while your dangling tea label becomes the kite itself (and doesn't fall back down into the cup). 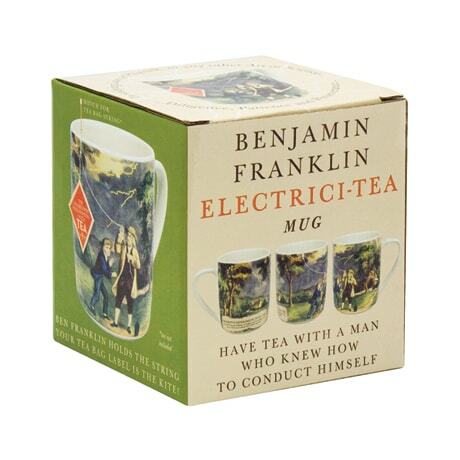 The large mug is presented in a decorative gift box that includes Franklin's published statement of his experiment, which appeared in the Pennsylvania Gazette of October 19, 1752: "As soon as the thunder clouds come over the kite, the pointed wire will draw the electric fire from them, and the kite, with all the twine, will be electrified, and the loose filaments of the twine will stand out every way and be attracted by an approaching finger. And when the rain has wet the kite and twine, so that it can conduct the electric fire freely, you will find it stream out plentifully from the key on the approach of your knuckle."